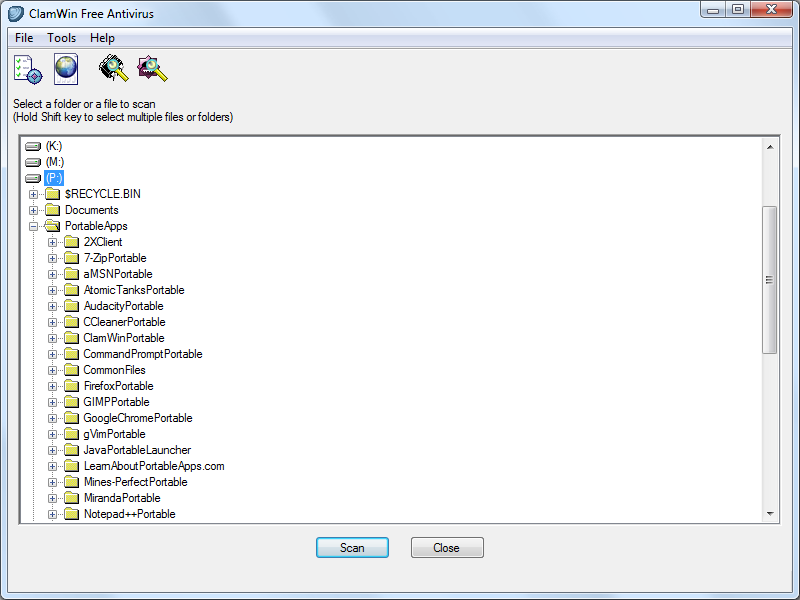 Old topic update: for lack of a better option, the present is now the official forum topic for ClamWin Portable (http://www.portablefreeware.com/?id=601). http://portableapps.com/apps/security/clamwin_portable wrote: ClamWin Portable is the popular ClamWin antivirus packaged as a portable app, so you can take your antivirus with you to scan files on the go. You can place it on your USB flash drive, iPod, portable hard drive or a CD and use it on any computer, without leaving any personal information behind. http://www.clamwin.com/ wrote: ClamWin is a Free Antivirus program for Microsoft Windows 8/7/Vista/XP/Me/2000/98 and Windows Server 2012, 2008 and 2003. ClamWin Free Antivirus is used by more than 600,000 users worldwide on a daily basis. It comes with an easy installer and open source code. [...] Please note that ClamWin Free Antivirus does not include an on-access real-time scanner. You need to manually scan a file in order to detect a virus or spyware. ClamWin Free Antivirus is based on ClamAV engine and uses GNU General Public License by the Free Software Foundation, and is free (as in freedom) software. http://www.clamav.net/about.html wrote: ClamAV is an open source (GPL) anti-virus engine used in a variety of situations including email scanning, web scanning, and end point security. It provides a number of utilities including a flexible and scalable multi-threaded daemon, a command line scanner and an advanced tool for automatic database updates. Last edited by Midas on Mon Mar 26, 2018 5:01 am, edited 1 time in total. ClamWin Portable v0.98.7 is released (stale changelog at http://portableapps.com/support/clamwin ... on_history; upstream ClamWin changelog is at http://www.clamwin.com/content/view/246/1/). Midas wrote: ClamWin Portable v0.98.7 is released (stale changelog at http://portableapps.com/support/clamwin ... on_history; upstream ClamWin changelog is at http://www.clamwin.com/content/view/246/1/). Am I missing something? ClamWin Portable 0.98.7 was released back in May 17 and our database entry is up to date. Upstream ClamWin v0.99 released (changelog is at http://www.clamwin.com/content/view/247/1/). Upstream ClamWin v0.99.4 released, dated 2018-03-15 (changelog is at http://www.clamwin.com/content/view/249/1/). Downloads for this release are at https://sourceforge.net/projects/clamwi ... in/0.99.4/. Please note that, for updating purposes, you needn't download the full 100MB+ ClamWin package. Please note that in my experience the 'clamwin-update-0.9x.x-0.9x.x.exe' file also present therein is nothing more than an online updater for the installed version of ClamWin. Upstream ClamAV v100.1 released (changelog at blog.clamav.net /2018/07/clamav-01001-has-been-released.html). The upstream official ClamAV webpage has (allegedly portable) 32 and 64-bit Windows builds available for download at http://www.clamav.net/downloads#otherversions (untested!). Due to the availability of working Windows binaries from the official ClamAV project webpage (see http://www.clamav.net/downloads#otherversions), some of them even represented as "portable" (untested! ), I move for changing the ClamWin entry, which hasn't been updated in a long time, to ClamAV. I think ClamAV is command line only in its Windows builds, unless it's changed. EDIT: I just checked and it's command line only. I see. Not that ClamWin doesn't resort to running commands in the CLI console, but in respect to site rules (as well as my own personal preference) GUI programs have preference here at TPFC. Motion withdrawn, then. Do you happen to know why the ClamWin version is lagging behind?